The National Reconnaissance Office (NRO) is one of the 16 U.S. intelligence agencies and considered, along with the Central Intelligence Agency (CIA), National Security Agency (NSA), Defense Intelligence Agency (DIA), and National Geospatial‐Intelligence Agency (NGA), to be one of the "big five" U.S. Intelligence agencies. The NRO is headquartered 2 miles (3 km) south of Washington Dulles International Airport. It designs, builds, and operates the spy satellites of the United States government, and provides satellite intelligence to several government agencies, particularly signals intelligence (SIGINT) to the NSA, imagery intelligence (IMINT) to the NGA, and measurement and signature intelligence (MASINT) to the DIA. The Director of the NRO reports to both the Director of National Intelligence and the Secretary of Defense and serves as Assistant Secretary of the Air Force (Intelligence Space Technology). 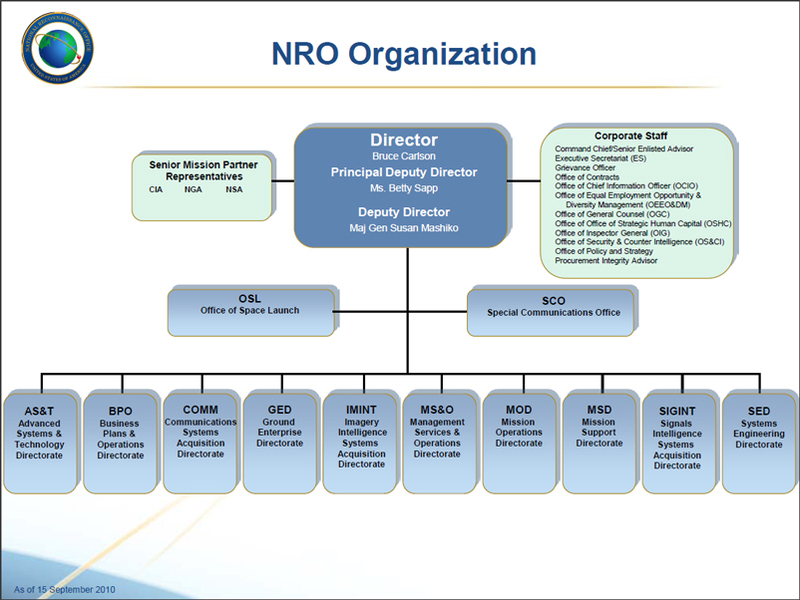 The NRO's federal workforce consists primarily of Air Force, CIA, NGA, NSA, and Navy personnel. A 1996 bipartisan commission report described the NRO as having by far the largest budget of any intelligence agency, and "virtually no federal workforce", accomplishing most of its work through "tens of thousands" of defense contractor personnel. In 2012, a McClatchy investigation found that the NRO was possibly breaching ethical and legal boundaries by encouraging its polygraph examiners to extract personal and private information from DoD personnel during polygraph tests that were purported to be limited to counterintelligence issues. Allegations of abusive polygraph practices were brought forward by former NRO polygraph examiners. A major restructuring occurred in 1993 with the dissolution of Programs A to C.
NRO derives its funding both from the US intelligence budget and the military budget. In 1971, the annual budget was estimated to be around $1 billion (inflation adjusted US$ 5.8 billion in 2019). A 1975 report by Congress's Commission on the Organization of the Government for the Conduct of Foreign Policy states that the NRO had "the largest budget of any intelligence agency". By 1994, the annual budget had risen to $6 billion (inflation adjusted US$ 9.5 billion in 2019), and for 2010 it is estimated to amount to $15 billion (inflation adjusted US$ 16.2 billion in 2019). This would correspond to 19% of the overall US intelligence budget of $80 billion for FY2010. For Fiscal Year 2012 the budget request for science and technology included an increase to almost 6% (about US$600 million) of the NRO budget after it had dropped to just about 3% of the overall budget in the years before. NROD 10-2 - "National Reconnaissance Office External Management Policy"
NROD 10-4 - "National Reconnaissance Office Sensitive Activities Management Group"
NROD 10-5 - "Office of Corporate System Engineer Charter"
NROD 22-1 - "Office of Inspector General"
NROD 22-2 - "Employee Reports of Urgent Concerns to Congress"
NROD 22-3 - "Obligations to report evidence of Possible Violations of Federal Criminal Law and Illegal Intelligence Activities"
NROD 50-1 - "Executive Order 12333 - Intelligence Activities Affecting United States Persons"
NROD 61-1 - "NRO Internet Policy, Information Technology"
NROD 82-1a - "NRO Space Launch Management"
NROD 110-2 - "National Reconnaissance Office Records and Information Management Program"
NROD 120-2 - "The NRO Awards and Recognition Programs"
NROD 120-3 - "Executive Secretarial Panel"
NROD 120-4 - "National Reconnaissance Pioneer Recognition Program"
NROD 120-5 - "National Reconnaissance Office Utilization of the Intergovernmental Personnel Act Mobility Program"
NROD 121-1 - "Training of NRO Personnel"
NROI 150-4 - "Prohibited Items in NRO Headquarters Buildings/Property"
NRO's technology is likely more advanced than its civilian equivalents. In the 1980s the NRO had satellites and software that were capable of determining the exact dimensions of a tank gun. In 2011 the agency donated two space telescopes to NASA. Despite being stored unused, the instruments are superior to the Hubble Space Telescope. One journalist observed, "If telescopes of this caliber are languishing on shelves, imagine what they're actually using." ↑ 1.0 1.1 "NRO Factsheet" (Word Document). p. 1. http://www.nro.gov/nro_factsheet.doc. Retrieved 2007-01-15. ↑ Federation of American Scientists. "The Evolving Role of the NRO". https://www.fas.org/irp/nro/commission/evolving.htm. ↑ Commission on the Roles and Capabilities of the United States Intelligence Community. "Preparing for the 21st Century: An Appraisal of U.S. Intelligence". http://www.gpo.gov/fdsys/pkg/GPO-INTELLIGENCE/content-detail.html. ↑ "U.S. Reconnaissance Satellites: Domestic Targets - Documents Describe Use of Satellites in Support of Civil Agencies and Longstanding Controversy". National Security Archive, The George Washington University. 2008-04-11. http://www.gwu.edu/~nsarchiv/NSAEBB/NSAEBB229/index.htm. Retrieved 2008-04-12. ↑ 12.0 12.1 Stares, Paul B.. "The Militarization of Space". p. p23,46. http://www.foreignaffairs.org/19851201fabook11624/paul-b-stares/the-militarization-of-space-u-s-policy-1945-1984.html. Retrieved 2008-11-24. ↑ Jeffrey Richelson (1990). America's Secret Eyes in Space. Harper & Row. ↑ 14.0 14.1 14.2 Paglen, Trevor (February, 2009). Blank Spots On the Map: The Dark Geography of the Pentagon's Secret World. New York: Dutton. ↑ 15.0 15.1 (Chief, Special Security Center) (1974-01-07). "History of NRO security breaches". National Reconnaissance Office. http://www.gwu.edu/~nsarchiv/NSAEBB/NSAEBB257/19740107.pdf. Retrieved 2010-12-22. ↑ "CIA and others: secret agencies studied". Sarasota Herald-Tribune. 1973. p. 4. http://news.google.com/newspapers?id=Df0jAAAAIBAJ&sjid=0WYEAAAAIBAJ&pg=352,5728451&dq=national-reconnaissance-office. ↑ 17.0 17.1 17.2 Bamford, James (1985). "America's Supersecret Eyes In Space". The New York Times. http://select.nytimes.com/search/restricted/article?res=F30D10F73D5F0C708DDDA80894DD484D81. ↑ Jeffrey T. Richelson (September 18, 2008). "Out of the Black: The Declassification of the NRO". National Security Archive Electronic Briefing Book No. 257. National Security Archive. http://www.gwu.edu/~nsarchiv/NSAEBB/NSAEBB257/index.htm. Retrieved 2008-10-13. ↑ Fitzgerald, Dennis D. (2005). "Risk Management and National Reconnaissance From the Cold War Up to the Global War on Terrorism". Journal of Discipline and Practice, 2005-U1. NRO. http://www.nro.gov/history/csnr/publications/docs/journal-01.pdf. Retrieved 2011-07-31. ↑ "Get Smarter: Demystifying the NRO". SECRECY & GOVERNMENT BULLETIN, Issue Number 39. Federation of American Scientists. August–September 1994. http://www.fas.org/sgp/bulletin/sec39.html. Retrieved 2008-10-13. ↑ "Lack of Intelligence". U.S. News & World Report. http://www.usnews.com/usnews/news/articles/030811/11nro_2.htm. ↑ Philip Taubman (2007-11-11). "Failure to Launch: In Death of Spy Satellite Program, Lofty Plans and Unrealistic Bids". The New York Times. http://www.nytimes.com/2007/11/11/washington/11satellite.html?pagewanted=all#step1. Retrieved 2007-11-12. ↑ 23.0 23.1 23.2 John J. Lumpkin, Associated Press, "Agency planned exercise on September 11 built around a plane crashing into a building", Boston Chronicle, September 11, 2002. ↑ John Schwartz (2008-02-05). "Satellite Spotters Glimpse Secrets, and Tell Them". The New York Times. http://www.nytimes.com/2008/02/05/science/space/05spotters.html. Retrieved 2008-02-05. ↑ David Stout and Thom Shanker (2008-02-14). "U.S. Officials Say Broken Satellite Will Be Shot Down". The New York Times. http://www.nytimes.com/2008/02/14/science/14cnd-satellite.html?pagewanted=print. Retrieved 2008-02-14. ↑ "DoD Succeeds In Intercepting Non-Functioning Satellite (release=No. 0139-08)". U.S. Department of Defense. February 20, 2008. http://www.defenselink.mil/releases/release.aspx?releaseid=11704. Retrieved 2008-02-20. ↑ Colin Clark (2008-07-03). "Spy Radar Satellites Declassified". DoD Buzz, through Military.com. http://www.dodbuzz.com/2008/07/03/spy-radar-satellites-declassified/. Retrieved 2008-07-10. ↑ Bruce Carlson (April 14, 2010). "Bruce Carlson, Director, NRO, National Space Symposium, Remarks". National Reconnaissance Office. 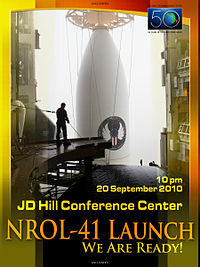 http://www.nro.gov/speeches/DNRO_National_Space_Symposium.pdf. Retrieved 2010-06-04. ↑ "NRO review and redaction guide (2006 ed.)". National Reconnaissance Office. http://www.fas.org/irp/nro/declass.pdf. ↑ "Town Hall presents PDDNRO Perspectives". National Reconnaissance Office - The Recon. June 1, 2009. http://documents.theblackvault.com/documents/spysatellites/RECON1.pdf. ↑ 36.0 36.1 36.2 John Pike (2010). "FY2010 Intelligence Budget". www.globalsecurity.org. http://www.globalsecurity.org/intell/library/budget/index.html. Retrieved 2010-12-22. ↑ Tim Weiner (1994-08-09). "Ultra-Secret Office Gets First Budget Scrutiny". New York Times. http://select.nytimes.com/gst/abstract.html?res=F40F16FE3C540C738DDDA10894DC494D81. Retrieved 2010-12-22. ↑ Dilanian, Ken (2010-10-28). "Overall U.S. intelligence budget tops $80 billion". Los Angeles Times. http://articles.latimes.com/2010/oct/28/nation/la-na-intel-budget-20101029. Retrieved 2011-01-08. ↑ America's Leadership Challenge (pre-event publicity pamphlet for National Law Enforcement And Security Institute [NLSI] conference "Homeland Security: America's Leadership Challenge", September 6, 2002). ↑ Boyle, Rebecca (June 5, 2012). "NASA Adopts Two Spare Spy Telescopes, Each Maybe More Powerful than Hubble". Popular Science. http://www.popsci.com/technology/article/2012-06/nasa-adopts-two-spare-spy-telescopes-each-maybe-more-powerful-hubble. Retrieved June 5, 2012. ↑ 41.0 41.1 41.2 41.3 41.4 41.5 41.6 Clapper, James R. (February 2012). "FY 2013 Congressional Budget Justification, Volume 1, National Intelligence Program Summary, Resource Exhibit No. 13". DNI. Archived from the original on 2013-09-02. http://web.archive.org/web/20130902215658/http://cryptome.org/2013/08/spy-budget-fy13.pdf. ↑ Dr. Bruce Berkowitz (2011-09). "The National Reconnaissance Office At 50 Years: A Brief History". Center for the Study of National Reconnaissance. http://www.nro.gov/history/csnr/programs/NRO_Brief_History.pdf. Retrieved 2011-10-24. ↑ "NRO Mission Ground Station Declassification". National Reconnaissance Office. 2008-10-15. http://upload.wikimedia.org/wikipedia/en/e/eb/Mission_Ground_Station_declassification.pdf.